This entry was posted on Monday, March 12th, 2007 at 14:14	and is filed under Planet Gnome, Planet Gnomefr, Software. You can follow any responses to this entry through the RSS 2.0 feed. Both comments and pings are currently closed. I don’t think the ‘record’ icon is appropriate or necessary. I suggest dropping the icon for the button. I was going to write a Photobooth clone! For the thumbnails of the images I planned to use EogThumbView from eog-ng branch. Do you have disortion effects in you program? They can be achieved using OpenGL and shaders. 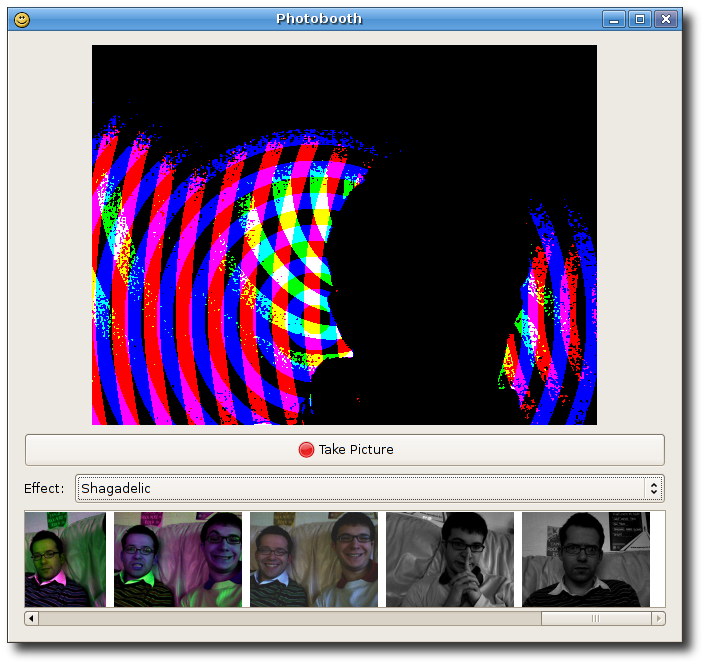 Well effects are provided by effectv gstreamer plugins. I suppose you could rite your own gstreamer plugin to do some more effects..
For the thumbnails i just use an IconView with a large number of columns, it seems to work quite well..
I’m willing to help you out if you want, it would be sooo cool! It would be really cool a flash effect when taking a photo like Apple’s Photobooth does. I believe this can be done if a composite manager is present. This looks pretty good, I think the record button needs to be changed a little tho. Because it uses gstreamer, it shouldnt be too hard to be able to record video as well right? Although sound would probably be another issue…. It would be great to have one of these included by default with Gnome. It is really a sad thing, that gstreamer doesn’t support v4l. I use my photo camera as webcam, connected via my TV-Card to the PC. Seriously, stop copying Apple. Where the hell is the innovation in GNOME? So many things are outright ripoffs of Os X. Its sad. Nautilus, the open save dialog, the control center, this. [quote comment=”11117″]Seriously, stop copying Apple. Where the hell is the innovation in GNOME? So many things are outright ripoffs of Os X. What about when apple stop copying us? Apple are just getting around to implementing ‘spaces’, if you’ve ever used linux you’ll see that in any window manager overlaying X11. Apple introduced time machine, the same effect has been achieved by many linux users by archiving their documents in CVS. What exactly are apple doing if not innovating? Oh, that’s right, putting a pretty GUI on top of it. And you say we’re idea thieving?……………. where is the code? i would like to try (and extend if neccesary) the app. Is this now A GSoC project? > Is this now A GSoC project?